Elevate Healthcare, the agency advocating for healthcare challenger brands, announced today that Founding Partner Lorna Weir has been named to PharmaVOICE’s list of the 100 most inspiring people in the life sciences industry. The honor, published in the July/August 2017 issue of PharmaVOICE, recognizes both leaders for their valuable contributions to the industry and dedication to improving patients’ lives, while also mentoring the next generation of industry leaders. 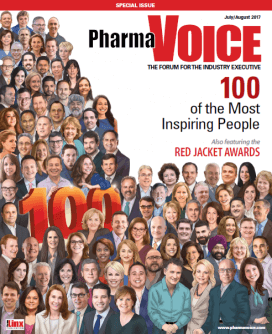 For more than a dozen years, PharmaVOICE magazine has been recognizing the most inspirational, motivational, and transformative individuals throughout the life-sciences industry in its annual July/August PharmaVOICE 100 issue. These individuals illustrate what it means to think bigger, do more, and lead with passion and integrity. This year’s distinguished honorees were nominated by thousands of PharmaVOICE readers and were selected for inclusion based on substantive accounts describing how they have inspired or motivated their colleagues, peers, and even competitors; their positive impact on patients, their organizations, and the industry at large; their innovative and game-changing strategies and thinking; their mentorship and guidance to the next generation of leaders; as well as their as their willingness to give their time and resources to their communities and philanthropic causes. “This must-read issue has become one of the most-anticipated and highly regarded publications of the year, and it is our great pleasure to showcase the 100 men and women who are demonstrating inspired leadership, collaborating across the life-sciences ecosystem, creating transformative and innovative changes, disrupting the status quo, and building relationships to position the industry in the best way possible to serve the ultimate stakeholders: patients,” says Taren Grom, Editor and Co-founder of PharmaVOICE. Published monthly, with the combined July/August PharmaVOICE 100 and November/December Year in Preview issues, PharmaVOICE is expressly written and designed to deliver the views, opinions, and insights of the executives who are shaping the direction of the dynamic and multifaceted life-sciences industry. PharmaVOICE reaches more than 41,000 BPA qualified subscribers and 60,000 users with its digital edition. PharmaVOICE’s unique horizontal editorial approach cuts across industry silos, providing a holistic overview of the life-sciences industry, addressing a range of topics from molecule through market. By engaging compelling personalities from diverse industry sectors, PharmaVOICE provides multiple perspectives on business challenges, trends, and topics. Editorial content sparks dialog, initiates debate, and opens the lines of communication to facilitate and improve business-to-business relationships. PharmaVOICE’s multiple-perspective and in-depth original forums, feature articles, topics, and departments are audience-driven. PharmaVOICE provides executives with useful peer-to-peer insights on a broad range of business practices and topics to a wide range of life-science sectors.